We’d love your help. Let us know what’s wrong with this preview of Little Bites by Christine Chitnis. Anyone with children knows the stampede that occurs whenever the phrase "snack time" is uttered. Children associate snacks with fun, tasty, easy-to-eat foods, but as parents, we know that the very best snacks are all that and more. Snacks, when Leave the packaged snacks behind! 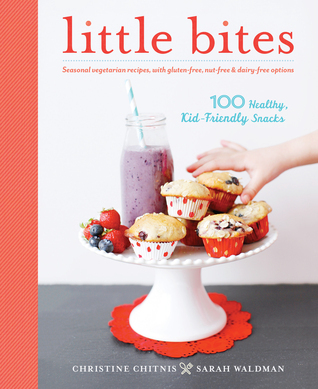 Little Bites offers 100 wholesome, seasonal, vegetarian snacks perfect for active families. To ask other readers questions about Little Bites, please sign up. I have a confession. Even though this book is targeted for kids, I wanted to read it in hopes of discovering some new snack options for myself. Working from home leads me to graze all day and sometimes that means realizing I just ate a half a box of crackers. I wanted some easy snack ideas and thought that the "for kids" angle would be perfect. I was right! A fun cookbook for little ones and adults alike. There are a lot of pointers throughout with beautiful pictures and tips on what to do for little kids and babies when introducing the foods in this book to them. There were wonderful combinations that are set for each season working on what is at the peak of perfection and making all sorts of new and delicious bite sized snacks that are nutritious as well as fun. Each recipe also gives you what nutrients are present in the recipes. These recipes a A fun cookbook for little ones and adults alike. There are a lot of pointers throughout with beautiful pictures and tips on what to do for little kids and babies when introducing the foods in this book to them. There were wonderful combinations that are set for each season working on what is at the peak of perfection and making all sorts of new and delicious bite sized snacks that are nutritious as well as fun. Each recipe also gives you what nutrients are present in the recipes. These recipes are going to be a lot of fun to make and lets be honest who doesn't love bite size snacks. Parents who want kids to develop healthy eating habits, make use of locally-grown fresh produce, and offer children a variety of foods will enjoy this sumptuously-photographed snack cookbook prepared by a pair of friends who met as young mothers. Seasonal recipes and ideas for making kids' snacks appealing to the senses as well as packed with good nutrition. great book full of good recipes, crisp clear pictures. my 2year old loves them. Thank you for goodreads free. Loved all of these snacks, and not just for a little person! I really liked this book. It provided real food, made with real ingredients, that was made in small amounts. I made a few different recipes and my family seemed to like them! Even though I don’t have children, I really loved this cookbook. The recipes were simple and each one seemed tastier than the last. I really appreciated that these were kid friendly, healthy snacks. Very cool. Great looking recipes, not very allergy friendly. I enjoyed browsing this cookbook with my kids. I appreciated that it is organized by season. Although some of the ingredients are kind of specific to the area the authors live in like rhubarb. The pictures are very inviting and got my 3 year old flipping through the book on their own as well as with me. They picked out several things to try and did eat a little of each of their selections. I would say that the recipes seem to be on the very "healthy" end of the scale so some of the things weren' I enjoyed browsing this cookbook with my kids. I appreciated that it is organized by season. Although some of the ingredients are kind of specific to the area the authors live in like rhubarb. The pictures are very inviting and got my 3 year old flipping through the book on their own as well as with me. They picked out several things to try and did eat a little of each of their selections. I would say that the recipes seem to be on the very "healthy" end of the scale so some of the things weren't as tasty as they could have been if made more conventionally. That said we did enjoy many of the recipes. I was also not a big fan of the lifestyle portion of the book. Although I do ascribe to many of the views expressed like reducing waste. This section was framed in a way that felt a little felt heavy handed and preachy to me. Although the intention of this cookbook is making healthy and tasty snacks for your children, I'll probably use it to make small meals for myself. My 3-year-old is not an adventurous eater, but hopefully he'll join me in a few of these treats. This was a really good book for healthy and delicious snacks. If I had children I would totally make things from this book. As it is I copied some of the recipes from this book to try out. I got this as a request from my local library. I really cannot wait to try some of these out. Christine is the author of Icy, Creamy, Healthy, Sweet (Roost Christine Chitnis is a mother, writer, photographer, and avid home cook. She lives with her husband and two young sons in Providence, Rhode Island. Her writing and photography are inspired by the farmland and coasts of her adopted home state, though her love of the natural world dates back to childhood summers spent in Northern Michigan.